My favorite kind of pasta! Sorry, I posted both, the full, and the one for you.. mia apology. Very funny… you touched a note… I just wrote this on my F’book (which I HATE…. blah blah blah…) but it was funny, to get your “like” on my blog. I hope you appreciate it. Best day of my life, I walk into “Harry’s Bar” in Venice with my wife and parents and a VERY OLD Giuseppe says “welcome home Cory.” and then Claudio says, “Americano…” with a laugh… because I only drank… wine in those days with those little Rabbit Croquettes. I own Iguana’s in Budapest. Have you been? Love this site! Thanks for “liking” my post today! It led me here. 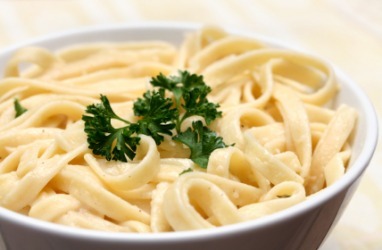 :) I wish I knew it was National Fettuccine Alfredo day earlier this morning b/c I totally would have made it for dinner! Though I guess any day is good enough for Fettuccine Alfredo! I just subscribed to the blog and am looking forward to reading more. Later! I LOVE Fettuccine Alfredo! Who knew they had a day for it. I could have that at least once a week, but that would blow my diet. So, I will just have to dream for now. Bits of Lobster, Snow Crab, and shrimp resting on top of a bed of Fettuccine Alfredo, served with warm garlic and parm breadsticks. Oooohhhhh! yum. fettucini. what great food facts. thanks for following me! What a terrific blog! We’ll be sure to visit often and to share freely with our readers and friends. What Pasta Princess doesn’t love Fettucine Alfredo? Thanks for following my blog! I thought about it for a second if I should follow your blog or not because I wasn’t sure how classy it would be of me to start drooling in public every time I got to read your comments on food with the amazing pictures you attach with each entry but then I remembered that I mostly read blogs at home and who cares if I’m drooling in my own room right? I can’t wait to read more! Love your blog, and this post is so yummy – great food for soul, mind & body! Love this post! It inspired me, I will make tortellini alfredo for dinner! Funny thing – my alfredo sauce is always better on tortellini. My sister’s was always better of fettucine. Who would have thought? Great quote!!! I’m not italian but I wish I was…. Fantastic site! Love the annotations on food history, I vow to eat pasta tomorrow in honour of Fettucine Day and if I may douse it in butter and cheese, even better!! !